Nick Sherman, on ladder, and wife Heather of Nick Sherman Design paint a logo and holiday images on what will be the first headquarters of the Friends of Portsmouth on Second Street. In time for Winterfest, this wintry scene and the non-profit’s logo occupy the windows to the right of the entrance to the coming Friends of Portsmouth HQ. Churches, retailers, even Scioto County Commissioner Bryan Davis – and, of course, organizers the Friends of Portsmouth – have gotten into the Christmas spirit by heavily decorating Boneyfiddle for the first annual Toyota presents Winterfest on Market Square. One half of the Rutman Burnside Realty Group and the still newly spokesperson for the nonprofit Friends group, Nick Rutman said the Friends of Portsmouth didn’t want their windows to be the only empty ones in Boneyfiddle during the holiday festivities. That explains why on Wednesday, even though the group’s new headquarters won’t open until January, a local design company was outside the Friends of Portsmouth headquarters on Second Street painting the windows of what will be the group’s public façade. Local attorney Jeremy Burnside is one of the leaders of the Friends of Portsmouth. Last month he told the Daily Times, the group will be gaining a headquarters partly to serve as the training center for what he and fellow Friends of Portsmouth leader, local developer Tim Wolfe, have described as a Portsmouth ambassadors’ program. Burnside said he once envisioned the ambassadors largely as a kind of the cleanup patrol. “We found out there was interest in doing something more than that,” Burnside said. At one point, Wolfe talked about Portsmouth Ambassadors walking around the city’s commercial districts being… ambassadors, that is, answering questions, directing visitors to where they want to go or even making suggestions as to locations folks might want to visit. Burnside said last month, in order to make that happen, the Friends of Portsmouth decided they would need a central location for volunteers to meet, plan and train. That location is currently an empty building on Second Street, a building which does not appear to have a displayed address. It sits on Second essentially across the street from the antique store Ghosts in the Attic. Directly next to the future headquarters is an alley with no visible name. Across the alley from the headquarters is the Salon on Second Street, a hairdresser with the address 513 Second St. The coming headquarters is close to where the Friends have set up a manger scene with live animals on Second. The building once was identified as the future home of Wolfe’s planned candy store, Sweet Addie Grace, named for his daughter. Wolfe told the Daily Times he still intends to open the candy store at some point at a different location in the future. In the meantime, Winterfest visitors can get a preview of the store’s future offerings in the Winterfest gift shop on Market Street. Burnside previously said besides being a meeting place for the Friends of Portsmouth, the new headquarters will serve as a stop for persons pursuing outdoor activities in Portsmouth. For example, Burnside seemed very excited about the idea of renting bicycles, adding Wolfe already has purchased a few prototype rental bikes. Fishing equipment and similar gear also may be available for rent at the Friends headquarters. It further could cater to the skateboard park being championed primarily by Portsmouth City Councilman Sean Dunne. Burnside said the Friends of Portsmouth likely will lease the building from Wolfe’s Eflow Development. He was careful to note the headquarters will not be in competition with the Scioto County Welcome Center near the city’s floodwall. “If anything, this will be something to complement that resource,” Burnside said. “But you can’t control the weather,” Rutman said, again adding the event has so far proceeded very well. 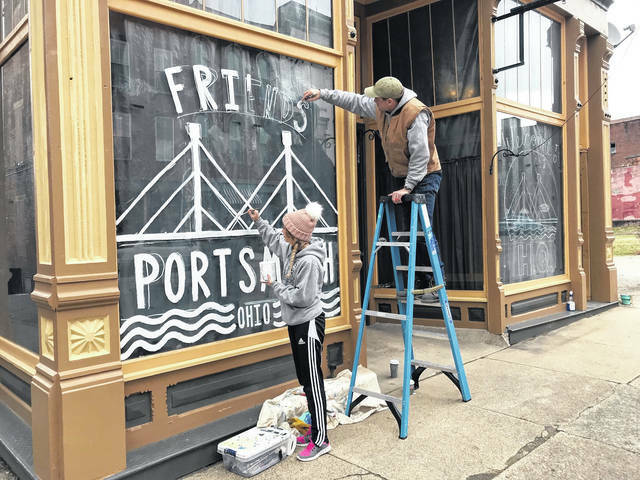 https://www.portsmouth-dailytimes.com/wp-content/uploads/sites/28/2018/12/web1_FOP-HQ.jpgNick Sherman, on ladder, and wife Heather of Nick Sherman Design paint a logo and holiday images on what will be the first headquarters of the Friends of Portsmouth on Second Street. 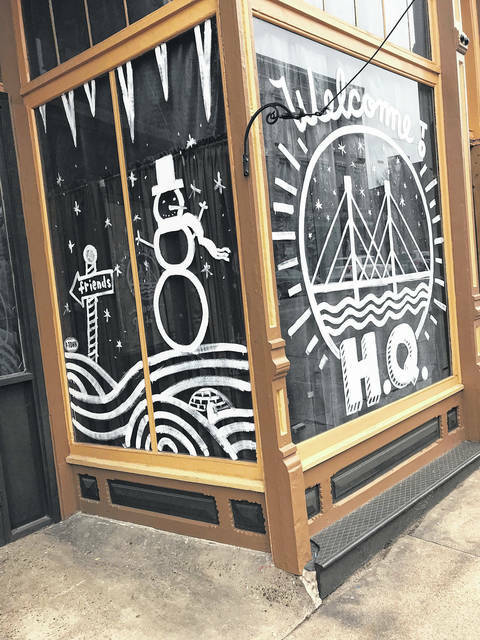 https://www.portsmouth-dailytimes.com/wp-content/uploads/sites/28/2018/12/web1_hq2.jpgIn time for Winterfest, this wintry scene and the non-profit’s logo occupy the windows to the right of the entrance to the coming Friends of Portsmouth HQ.